Rent The Chattooga Club | Corporate Events | Wedding Locations, Event Spaces and Party Venues. The Chattooga Club is a family-friendly private club and residential community, reminiscent of the exclusive, family-focused mountain retreats of the early 1900s. Established in 1988, The Chattooga Club blends regional, cultural and architectural heritage with modern luxury and amenities. Whether you choose an intimate wedding celebration or grand Cashiers celebration, The Chattooga Club team will guide you effortlessly to make your dream wedding a beautiful reality. As lovers of the family, there is perhaps nothing that makes us happier than helping handcraft the mountain wedding of one's dreams. The Chattooga Club extends an invitation to members and their families to share the joy of their nuptials by giving us the rare privilege of hosting them. Should you choose to become part of our extended family, you'll also enjoy the unparalleled privileges and amenities that accompany membership. Our six distinct event venues provide an array of beautiful indoor and outdoor space for intimate and grand Cashiers weddings. 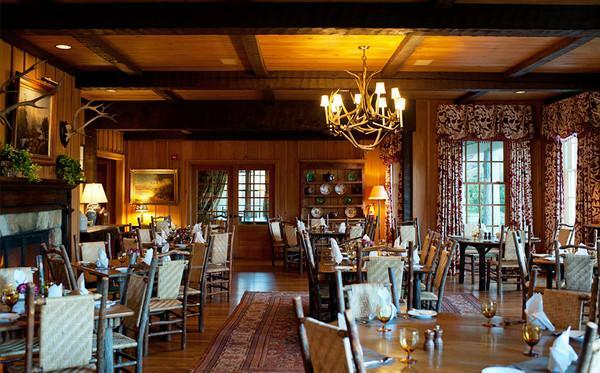 Whether you're a party of 14 or 400, The Chattooga Club has the ideal space to suit your style and celebration. In addition to our stunning spaces, The Chattooga Club has strong relationships with an array of preferred vendors in the Cashier's area, including wedding planners, photographers, and entertainers. We'll be delighted to make introductions and coordinate communication to ensure a seamless, elegant event. A mountain wedding or celebration isn't complete without luxurious mountain accommodations. Treat your bridal party, family, or special guests to The Chattooga Club's seven perfectly appointed Lodge Suites or The Guest Cottages. ndulge and immerse yourself in an array of amenities and activities – from a private lake, hiking trails, and heated saline pool to world-class croquet lawns, fitness center, and luxury spa. See more amenities. Our perfectly appointed accommodations come with their own luxurious amenities that will pamper, relax, and rejuvenate you. Browse our accommodations. Whether you're in search of an idyllic, unique venue for an incomparable celebration, a corporate retreat, or an unforgettable wedding, The Chattooga Club offers the beautiful spaces, cuisine, and accommodations that make for flawless events that live on long after the celebration ends. Plan an event with us. Become part of a Cashiers mountain community where family and land come together in perfect harmony.